In this article, we will show you, How to write a C Program to Find Sum of First and Last Digit Of a Number with an example. This program allows the user to enter any number. And then it is going to find the Sum of First Digit and Last Digit of the user entered value. This program will use While Loop to find the First Digit of the user entered value. We already explained the Analysis part in our previous articles. So, Please refer First Digit and Last Digit article to understand the same. 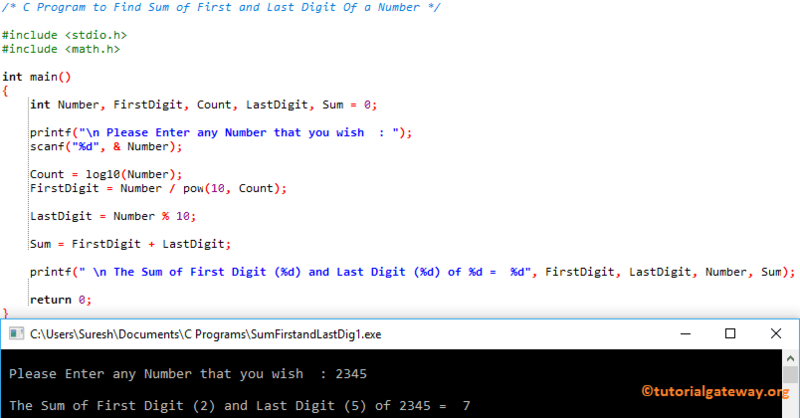 This program is the same as above but this time we divided the code using Functions concept.